Dekota Kirby spent the last eight months busy on the court and off. She attends classes for the Sports Management program in the morning, in the evening she trains and plays basketball games, and in between she squeezes in time for homework and studying. Kirby’s commitment led her to win several awards this season, including the CCAA All-Academic award, which is awarded to students with honour roll status and named to their provincial all-star CCAA sport. She also won the Bert Dejeet Memorial Scholastic Award for top GPA of all athletes. “I do take pride in getting good grades and being a leader on my team, as well, so the fact that I am able to be recognized for it, it feels good that at least someone is noticing it,” she says, adding her teachers, coaches and teammates act as support for her, academically and athletically. The honours came at the DC Academic Athletic Awards on April 13. The awards recognized student athlete’s academic achievements. Kirby says athletics has helped her excel through school. She has learned to manage her time and stay dedicated by working around her basketball schedule. Scott Dennis, sports information and marketing coordinator, was involved in the planning of this event. He has worked at the college for ten years. Dennis said the luncheon was originally a part of the athletic banquet. But because of the number of awards, it seemed rushed, and there needed to be proper recognition for academic award winners to celebrate their success. 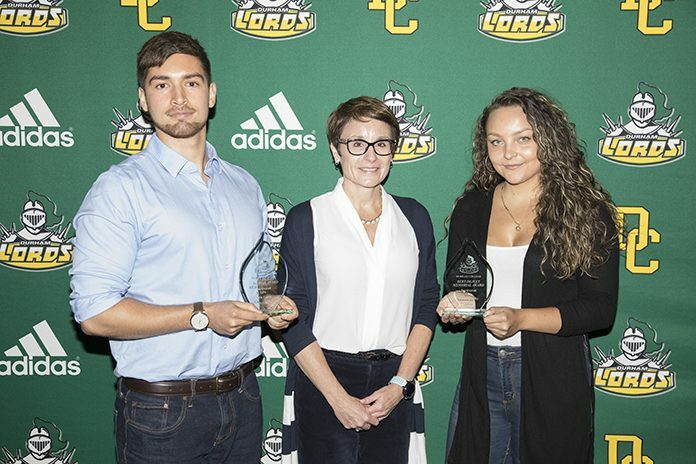 This year, the awards recognized a program high of 37 students winning OCAA awards, beating out the previous record of 28 set in 2014. Christopher Carey was the male winner of the Bert Dejeet Memorial Scholastic Award. The other OCAA All-Academic award winners were Erik Janssen and Nicholas Axhorn. For a full list of award recipients visit the Durham Lords website. Cecelia is a first-year journalism student. She is interested in a variety of topics and likes writing about stories that impact people.